The Basilica at La Sagrada Familia, which was consecrated in November 2010. Construction of La Sagrada Família started in 1892. Barcelona is not the capital of Spain, but there is little doubt that it is the cultural center, known for its fashion, art (including museums dedicated to Pablo Picasso and Joan Miró), and especially its architecture. Here are one site you know about and one far less known. Antoni Gaudí took over as chief architect of La Sagrada Familia in 1893 and transformed the project with his architectural and engineering style, combining Gothic and curvilinear Art Nouveau forms. La Sagrada Familia. Barcelona's beloved architect Antoni Gaudí is synonymous with the Catalan capital, home to several of his modernist masterpieces. Even if you're not familiar with his name, you can't miss La Sagrada Familia (The Holy Family), Gaudí's gigantic, unfinished Catholic church whose swirling, layered spires tower over the landscape. When Gaudí died in 1926, at 73, the project was far from complete. The race is on to finish it by 2026, the centenary of the architect's death — a benchmark that will no doubt lure more visitors to what is already the top tourist attraction in the city. More than 4.5 million people a year tour the fantastical structure, a UNESCO World Heritage site, which is adorned with ornate flourishes inside and out. 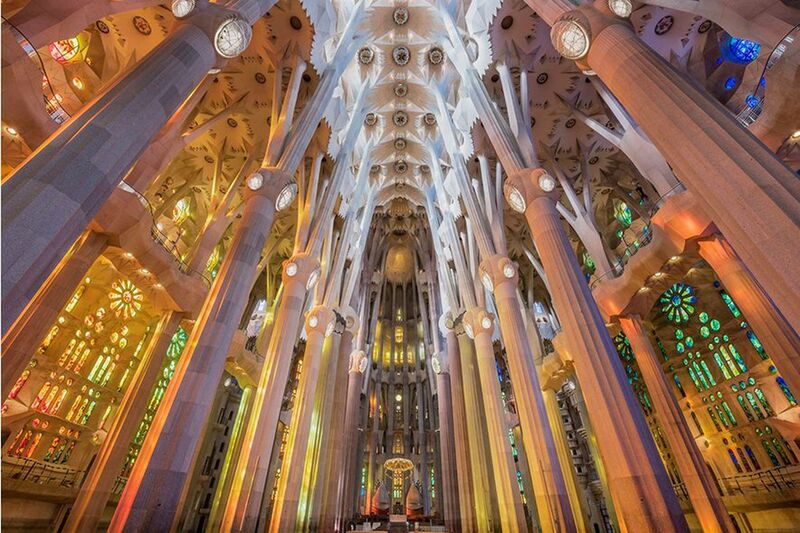 A few decades ago, a visit to La Sagrada Familia felt reverential, but today's crowds of admirers dull that impact as they shuffle into the church and bump into each other while snapping selfies in front of panes of stunningly bright stained glass. Consider purchasing timed tickets online in advance. And brace yourself for the frenzy. The museum and research and cultural center named Sant Pau Recinte Modernista once housed the Hospital de la Santa Creu i Sant Pau. Sant Pau Recinte Modernista. The cure for tourist overload in Barcelona is a visit to the hospital — or at least the site of the former Hospital de la Santa Creu i Sant Pau (Hospital of the Holy Cross and Saint Paul). Now named Sant Pau Recinte Modernista (Sant Pau Art Nouveau Site) after its transformation into a museum and research and cultural center, this stunning complex set on 40 acres is the work of Barcelona's lesser-known but equally genius architect Lluís Domènech i Montaner (1849-1923). He, too, holds a high place in the canon of Catalan modernisme, Spain's version of Art Nouveau, so much so that the hospital complex (along with his sparkling 1908 Palau de la Musica Catalana, an active concert hall) is also a UNESCO World Heritage site. At the grounds, only a 10-minute walk north from La Sagrada Familia, you're stepping out of a bustling metropolis and into a leafy park. The complex, constructed between 1905 and 1930, was designed like a little self-contained village. Over the years, the buildings fell into disrepair and were vacated in 2009. (The hospital moved to a new facility nearby.) The complex reopened in 2014 with most of its buildings restored; the restoration of others remains in progress. The architectural thrills start at the entrance building, which houses an iconic clock tower. Other splendid art nouveau features include dazzling stained glass windows, ceilings covered in mosaics, domes capped in glistening tiles, and a vast assortment of spires and finials. The grounds include beautiful gardens and seating areas designed for patients and visitors — and now tourists — to enjoy fresh air and sunshine.